ProBite's lead free push connect™ stop end connectors are easy to install and easy to remove. Using Push Connect™ technology, our stop ends can be installed in seconds without the use of glues, calks and special plumbing tools. Great for pressure testing, central heating systems or any application where the flow of water might need to be interrupted. 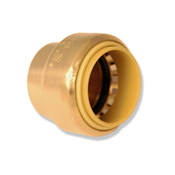 ProBite's lead free push connect™ stop ends are great for direct or indirect cold water systems, unvented and vented hot water systems and smore. 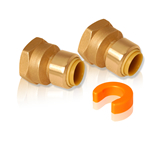 Straight Female Push Connect™ Adapter 1/4PC x 1/4" FNPT 1/2" x 3/8" OD Comp. x 3/8" OD Comp., 3-way, Chrome Plated 1/4 Turn Push Connect™ Stop Valve Tee, Lead Free High Torque Premium Tube Cutter : Built in tube reamer, file & spare cutter 1/8"- 1 1/2"